Mikael Cho is the co-founder of Crew, a network that connects short-term software projects with handpicked developers and designers. This post originally appeared on the Crew blog. We changed our business model and had three months worth of cash left to turn things around. If we didn’t we were toast. Done. This was our situation a year and half ago at Crew. We knew we had to grow but we didn’t know how we were going to do it in a substantial way. Things like blogging work but can take months before they have a big impact. Building a great product to generate word-of-mouth is a must but that takes time too. Even though we were working on these things, we needed to find a way to accelerate “normal” growth if we were going to survive. A $19 Tumblr theme and three hours later, we had a site called Unsplash, with 10 of our best extra photos and a link back to our homepage. We put unsplash.com live and shared the link on HackerNews – a website that lists the best things found on the internet and allows members to vote on the submissions. The HackerNews community is largely made up of designers, programmers and entrepreneurs – an audience we thought might find Unsplash useful. I went back to HackerNews to check what might be going on. Unsplash was featured as the number one site. We then saw a huge spike in traffic to our homepage for Crew. A large number of customers came. And a whole lot of love. Substantially more than we ever got from any ad campaign or blog post. 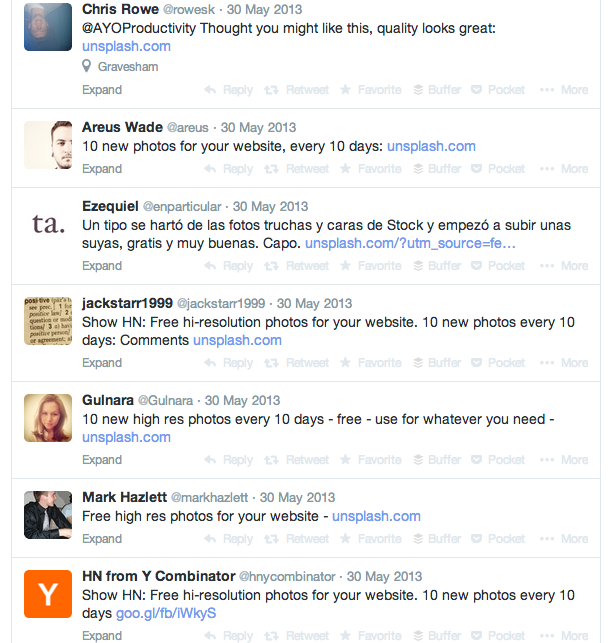 Here’s a shot of the tweets that came through the first moments Unsplash was live. This all came from something that took less than an afternoon to create. It seemed like magic. How could this happen? More people cared about us in a few hours than in the entire last year. We made Unsplash to give something valuable to people. We thought even if a few hundred people find it useful, that’d be a win. But we didn’t expect it could have this level of impact. Networks like Facebook, Twitter and Instagram feed in content at a high volume. Multiple devices for home, for work, and everything in between allows this stream of content to seep into every aspect of our daily lives. Your company messages are mixed in with photos and updates from friends and family. To have customers and fans, you need to create value first. In today’s world, this is often much more value than you think. When you create value first, people pay attention. Just because a project might be a website or app where code needs to be written, we tend to label it side project if it’s not the core product. This isn’t always true. A website or app might just be an advanced form of marketing. We shouldn’t be too quick to classify something as an unrelated side project without understanding its purpose. 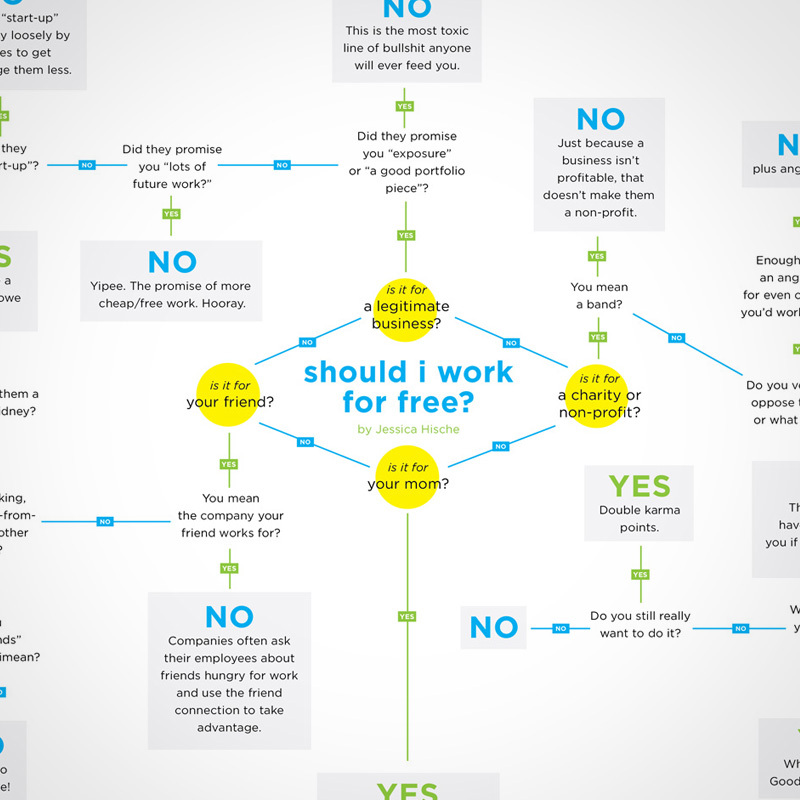 In the freelance world, many professionals work with clients and have their own independent projects; oftentimes, to help build their personal brand. Designer Jessica Hische has now worked with notable companies like MailChimp and Pinterest. But when she started, she needed to find her first clients just like everyone else. To stand out, Jessica started working on side projects early on in her career. Apart from being interesting and valuable, these side projects also showed Jessica’s skills as an illustrator. Apart from the quality of her work, these side projects helped Jessica accelerate her exposure in the design community and attract clients. Similarly, when no one knew about our company Crew, we needed to find a way to quickly meet customers. Because we are a technology startup, andstartups are largely defined by growth, we needed to find ways to grow faster than a normal rate. Building tools was one way we thought we could do this. The psychological benefits of side projects, like improved collaboration and better ideas, have been documented. It’s one the reasons why Google created the 20 percent time for employees to work on whatever they want. But there’s also a measurable impact from side projects. In the past year and a half since we started Crew, we made four projects that are separate from our Crew domain. 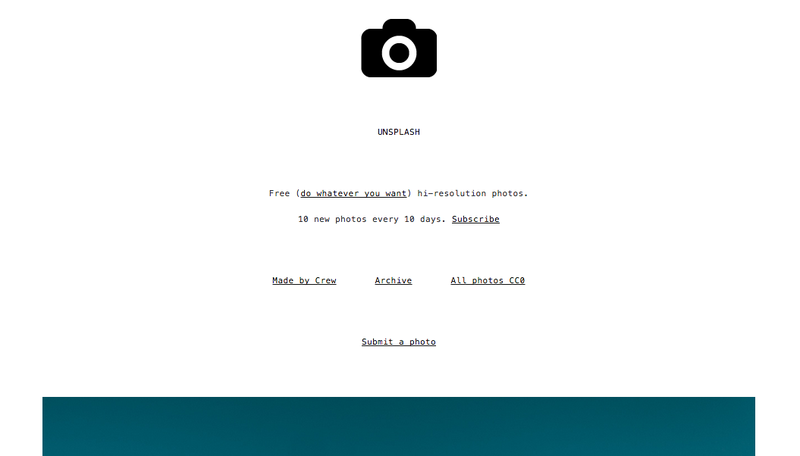 Unsplash is website that offers 10 free (do whatever you want) hi-res photos, every ten days. Launch This Year is a collection of weekly lessons on how to build a business, handpicked by Web industry professionals like Naval Ravikant, Founder of AngelList and Hiten Shan, Founder of KISSmetrics. 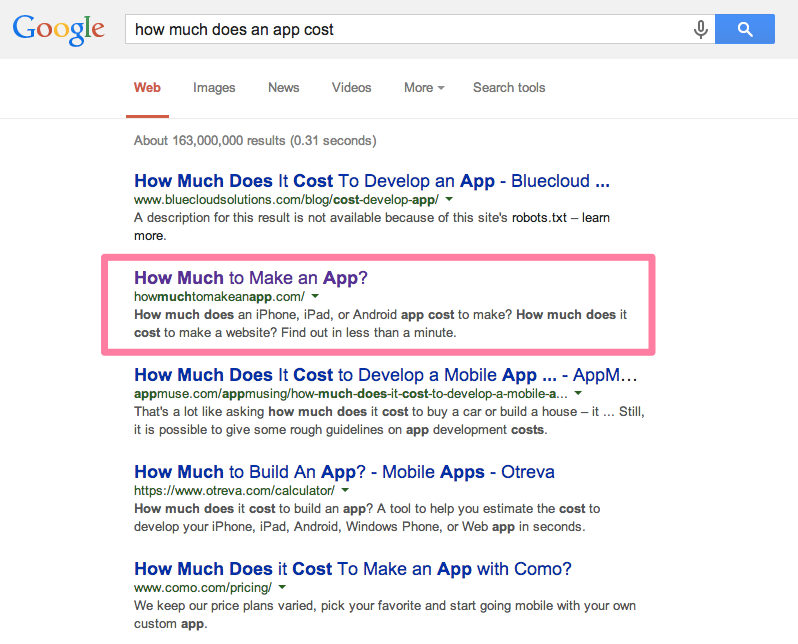 How Much To Make An App is a website that helps you estimate the cost of your app idea in less than a minute. 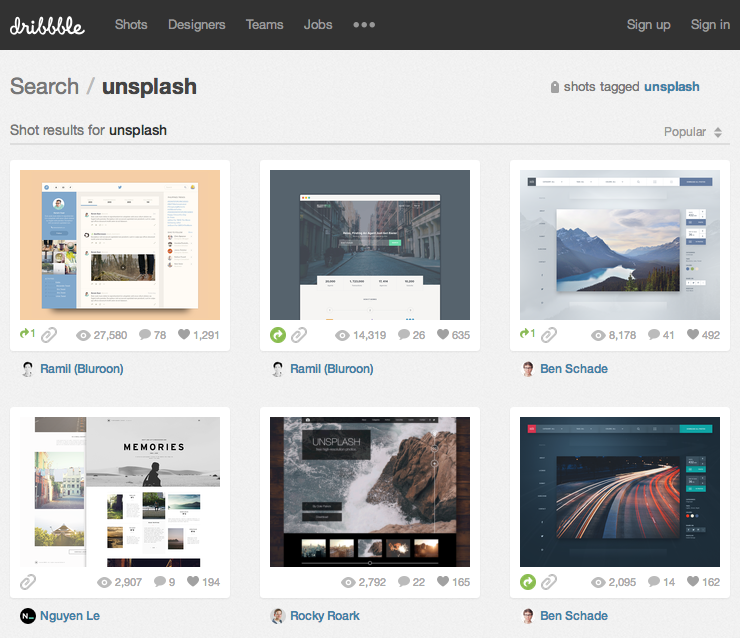 Moodboard is website that allows you to share your website design ideas with a link. No account needed. If we compare the data from these projects to our blog, they’ve been more efficient for building an audience. Although our blog does well and is the #3 referral source to Crew, it took us over a year and 85 posts to get to this level. The projects above have generated more than 25 times the number of subscribers with less time investment. Creating a tool often requires less time than writing blog posts but can have a much bigger impact. When you need to grow fast, you’re looking for impact. 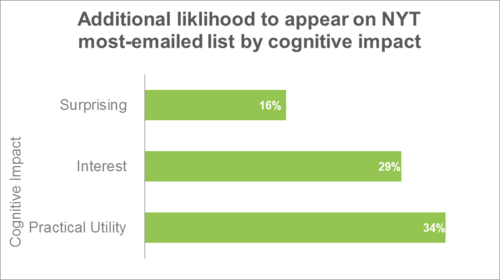 Granted, writing is important for more than just bringing in new customers and email subscribers. It’s also about building trust and a connection with the people who might use your product someday. But making a tool has the same effect, just at an accelerated rate. It’s more likely you’ll use a good product many times than read a good blog post many times. This repeated usefulness is what makes software products so valuable. When you create an app or website as marketing, you’re able to extract the value that exists in software and apply it to marketing. People keep coming back even though you’re not putting in extra work. This is what happens with many of our projects. Here’s a look at the repeat visitors to Unsplash in the past month. Over half the visitors have already visited the site before. With a blog, you need to continually produce content at a high level and high rate to keep people coming back. This is possible it just takes longer. We didn’t expect these projects could help with hiring but we noticed that many applicants came after seeing one of the tools we created. We get 50 applicants a week from Unsplash alone. Almost half the current Crew team said they found us and applied because they saw one of our projects. We also noticed that we tend to attract the type of people who align with our belief of creating value as the best form of marketing. These are the people we want on our team. When we see the value these projects create, this inspires ideas for how we can do things differently across all the other parts of our company. How can we take customer support or our hiring process to another level? Just as marketing has evolved, other areas of building a business are changing too. Seeing the impact of side projects on marketing encourages a mentality to think about how can we do things differently, not just follow what other people have done because it has worked in the past. Many of our side projects are potential features that we’re considering building into Crew. By putting them on a separate website, it allows us to test these features without diluting our core offering. If you build your tool on a separate website, what you sacrifice in not having on your domain, you gain in exposure and memorability. There’s more opportunities for press coverage and to be featured on product discovery websites like HackerNews or Product Hunt. People remember the project name Unsplash, or search for keywords like, “How much does an app cost?” rather than having to remember a domain like free-photos.pickcrew.com or howmuchtomakeanapp.pickcrew.com. Because it’s easier to remember the name, repeat usage can be higher and word-of-mouth can spread faster. You can find a way to link back to your domain to get the referral traffic. Usually we start with a link that says “Made by Crew.” This often does the trick for us. Because of the amount traffic, tools are also great for winning search engine keyword terms you’re after. 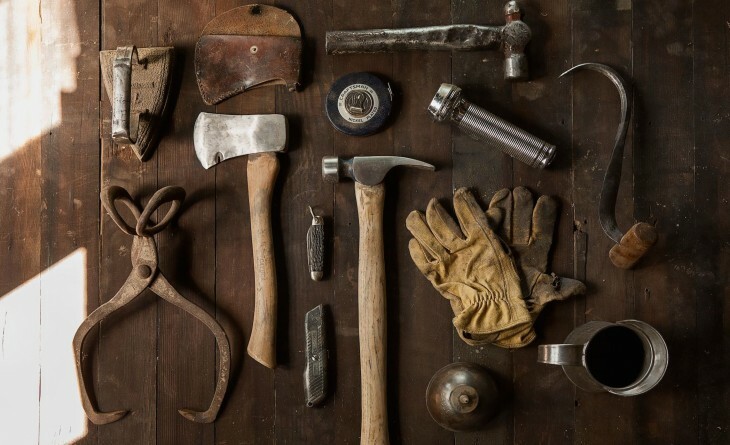 With the right tool you can outrank a blog post and make it to the first page of search results quicker. That’s exactly what they are. With a side project, the best approach is to keep it simple. Solve a problem in a much simpler way than anyone else. Reduce features to the minimum. Don’t worry about accounts. Don’t even worry about code if you don’t have to. Unsplash was made without writing a line of code. Simple will be your edge. Because your side project will be small in scope, you also reduce the need for maintenance and updates. Your aim should be to get the project working so it either needs no future updates or it needs very little to provide continuous value. We only update one of our projects if it’s doing exceptionally well and the update has the potential to make it much better. “Exceptionally well” to us usually means the project is a top 5 referral source. When we built How Much To Make An App for instance, we released it and did very little with it after. Only when we saw the value it was creating did we decide to make improvements that could have a big impact. If you release a project and it doesn’t resonate with your audience, leave it and move on to something else. Don’t take more time trying to make it better. It’s usually more efficient to try something different. Don’t be trapped into thinking you have to follow what everyone else is doing because it’s supposed to work. If you follow, expect similar results. Nothing more. To make a substantial impact in how your company is growing, you must create extreme value. This is the only knife that can cut through the clutter of today.